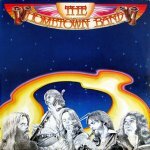 One of BC's first bands to lay claim to the 'supergroup' title was Hometown Band, formed in 1975 by Claire Lawrence, who'd recorded a '73 solo album, and also ex of Collectors, Chilliwack and production work for TV's "The Beachcombers" and CBC Radio's "The Great Canadian Gold Rush," on sax and flute, Shari Ulrich (Pied Pumkin) on vocals and violin, guitarist Doug Edwards, ex of Skylark, and seasoned session players Robbie King (who played a major hand in Terry Jacks' "Seasons In The Sun" and also toured with The Supremes) on keyboards and drummer Geoff Eyre. It wasn't long after their formation and with only a few live Vancouver shows behind their collective belt that they hooked up with folk star Valdy. Together they released VALDY AND THE HOMETOWN BAND in 1976, his fifth album. But with manager Cliff Jones, they struck out on their own later that year and landed a deal with A&M Records. 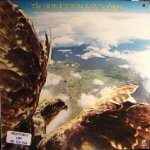 With Lawrence producing, they entered Little Mountain Studios, and came out in early '76 with their debut album, FLYING. Three singles ensued, starting with "Mad Larry" b/w "Wingless Bird." An edited version of the twelve-minute opus "Spread 'Em All Around" then appeared as the b-side of the title track, and then "I'm Ready" before the end of the year. The album was a mix of songs written for them, and those they wrote themselves were mostly collaborations. Written by Joe Mock, the title track was something Ulrich had originally done with him in Pied Pumkin. With a blend of folk, roots, and a bit of blues thrown in for good meaure, the album was an underground hit around the country. A cross-Canada tour followed and helped fuel sales, with the album eventually nearly reaching the gold status, selling close to 50,000 copies. They returned with their self-titled sophomore album in the spring of '77, and like its predecessor, Lawrence was tasked with production. It was another often-eclectic blend of influences and genres, and saw three singles hit the charts. "What Would I Do," "Halleluya, Do Ya," and "Feel Good Side" all did relatively well on the charts, although none broke the top 20. Another cross-country tour ensued, and the band picked up a Juno in 1978 for most promising group. By the end of that year, although some material had been written for a new album, everyone's outside interests got the better of them, and the band folded, and Ulrich was left to fulfill the band's contract with A&M. She would go on to a successful solo career, and also collaborate with Roy Forbes and Bill Henderson to form UHF for a pair of commercially successful and critically acclaimed albums. King became a sessions player, working with Bryan Adams, Olivia Newton-John, Tina Turner, and Alice Cooper. He succumbed to cancer on October 17, 2003. Claire Lawrence recorded a second solo album in 1980, and also did some production work for the likes of UHF, Connie Kaldor, and Valdy, as well as some work with CBC Radio, including "Jazz Beat," and for TV, including CTV's "Northwood" and "Cold Squad." Eyre went on to play with a number of groups, both as a studio and as a touring drummer, the most noteable of which was Powder Blues. Edwards also became a highly sought-after studio player, and eventually joined Chilliwack in the late 1990s.